Price to sell! 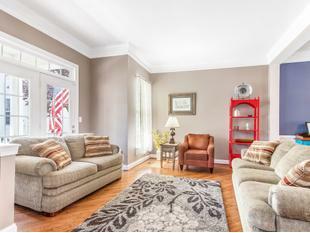 Carriage Home offers easy In-town living, 4 bed, 3.5 baths with LL bonus bedroom. New Roof 3, 370 sf, Beautifully maintained home, new roof, gourmet kitchen & updated appliances, hardwood floors & the pellet stove efficiently heats this home! Relax on your large Trex front porch or stoned & fenced rear patio. 2 car garage w/ floored attic offers much storage.